Ametherm manufactures precision resistance-temperature matched ACCU-CURVE™ thermistors. These devices offer interchangeability over a broad temperature range and eliminate the need to individually calibrate or provide circuit compensation for part variability. Accurate temperature measurement to ±0.2°C is available over the 0°C to 70°C temperature range. Standard ohmic values at 25°C range from 2,252 to 100,000 ohms. Request Free Samples Have A Question? Microprocessors, A/D converters, interface electronics and displays are readily available. Circuit designs with built-in thermistor resistance-temperature algorithms have gained wide spread acceptance in precision temperature metrology. Ametherms’s ACCU-CURVE™ style thermistors are used in many applications that require a high degree of accuracy and reliability. 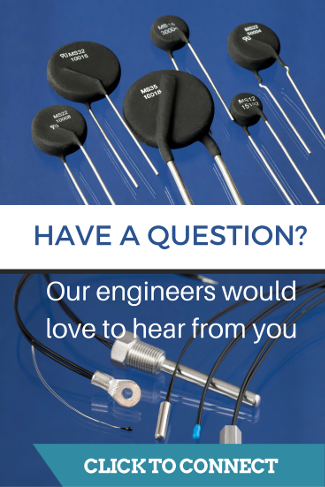 They commonly perform temperature sensing, control, and compensation for medical, industrial, and automotive applications. 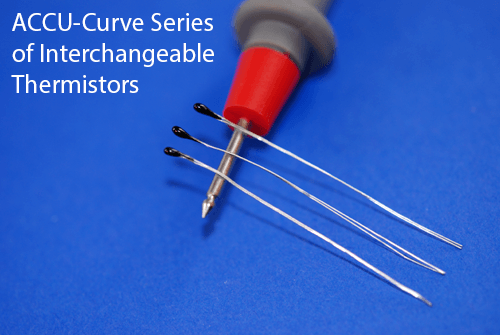 Interchangeable ACCU-CURVE™ NTC thermistors are usually selected when a high degree of measurement accuracy is required over a wide temperature range. By modifying the Alpha equation the resistance and temperature tolerances can be calculated for various temperature intervals. Because thermistors are non-linear with respect to their resistance-temperature characteristics, Alpha therefore is non-linear across their resistance-temperature range. As an example, a thermistor material curve with an Alpha of -4.4%/°C @ 25°C will have an Alpha of -3.8%/°C @ 50°C. For practical applications we recommend that the standardized R/T curves be used. Ametherm ACCU-CURVE™ thermistors can dissipate 1mW/°C. As a result, the possibility of error induced by excessive current flow, which would defeat the level of accuracy these devices are capable of representing, may exist in some circuits. To prevent this type of error, Ametherm recommends that circuit design engineers select the highest R value their circuit will tolerate for applications > 5 Volts to minimize any self-heating of the thermistor device. Refer to the ACCU-CURVE™ Specifications table for resistance values and temperature tolerances. Ametherm offers two standard R/T curves, “C” & “W”, with temperature coefficients of resistance of -4.4%/°C and -4.7%/°C, and Beta (ß) values of 3965°K and 4250°K. To determine the nominal resistance value of a thermistor at a specified temperature, multiply its resistance at 25°C value by the corresponding RT/R25 value for the desired temperature and applicable R-T curve from the ACCU-CURVE™. Selection Considerations for NTC ACCU-CURVE™ Devices Interchangeable ACCU-CURVE™ NTC thermistors are usually selected when a high degree of measurement accuracy is required over a wide temperature range. By modifying the Alpha equation the resistance and temperature tolerances can be calculated for various temperature intervals. Check out our featured ACL_011 with insulated tinned-copper leads, ensuring the most accurate temperature sensing with no unintended conduction between leads. The ACCU-CURVE™ device can also be supplied with 32 AWG solid Teflon insulated leads of 3, 6, 9 and 12 inches in length. contact Ametherm applications engineering for additional information. Warning: Use Heat sinks when soldering to Thermistor Leads. To determine the nominal resisteance value of a thermistor at a specified temperature, multiply its RT/R25value for the desired temperature and R-T curve from the table above by its nominal resistance at 25 °C. 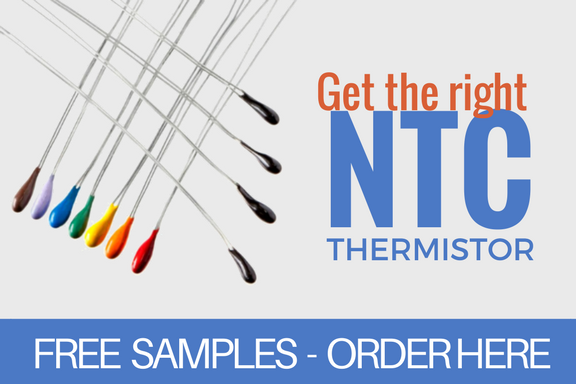 What is an NTC thermistor?